Today we’d like to introduce you to Marizel Almirall. Marizel, please share your story with us. How did you get to where you are today? I am a modern-day witch and have always experienced life from a different perspective than those around me. My mom along with many strong women in my family encouraged me to find my voice and share my gifts and follow my dreams. I feel the energy in everything I communicate with animals and am a Birth and Death Doula bringing in my own little beings into this world as well as releasing loved ones during their final moments. In 2001 I met the love of my life and I shared with him my vision of having a mystical oasis where I can offer my services, make my art and express my creativity and so after the birth of our daughter in 2004 at The Coral Castle Psychic Fair we setup our first little display and launched our website. Every month we grew more and started expanding to Armando making wood burned altars, staffs with custom leather and copper jewelry. I started offering my psychic sessions and we took place of the fair every month for 7 years. In 2006 after the birth of our second daughter, we wanted to see a family festival come alive where people can come drum and dance celebrating life taking workshops and meeting local businesses and artists. We talked with the castle manager and for 5 wonderful years a total of 20 shows we manifested MoonFaire a Magical Event At A Powerful Place. Throughout the years, we joined many festivals including Miccosukee Music Festival, Earth Fest, Pagan Pride, Full Moons at Tobacco Road and more. In 2010 we opened our shop in the heart of Hialeah inside of the Celis Art Building. It was a great 5 years and we hosted a lot of classes and gatherings free for the community monthly. We offered our handcrafted jewelry and wood work, healing sessions, psychic readings, reiki, custom ritual kits, candles and ceremonies. Pretty much all we continue to do but stuck in between 4 walls while trying to raise a family and be involved out in the community. Our girls grew and a lot of amazing people came together forming a growing family that till this day continues expanding. Even though it was a lot easier running the shop than being at all the events we really missed the outdoors and the reality is that our clientele is always expanding so we followed our intuition and after 5 years closed the shop and planned a road trip and full weekend family festival. On December of 2015 we hosted our MoonFaire camp out in the woods of Summerland in Bonita Springs. 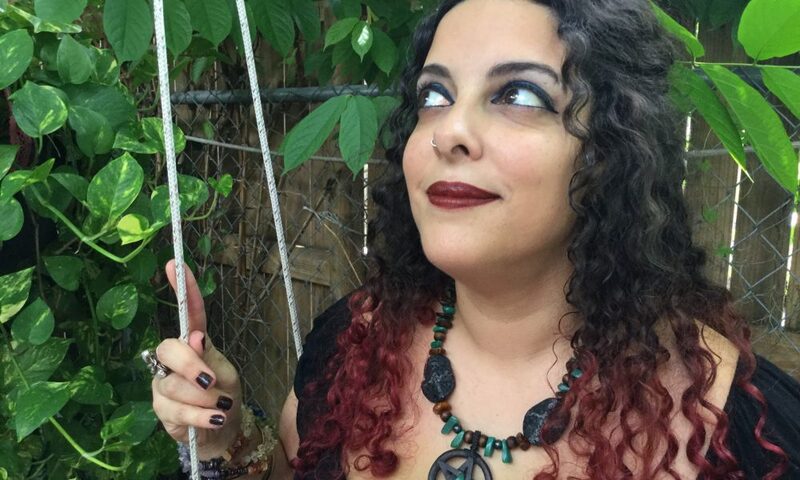 On May of 2016 my husband Armando The Witch Doctor and his band Black Sun Prophets Headlined the first Pagan Music Festival in the hills of GA and we setup The Witch’s Garden booth for the first time out of state. Currently we are both writing our books and raising our family and we recently welcomed the final piece to the vision I had long ago, our son. We continue to offer our spiritual services and ceremonies as well as Reiki and healing sessions to our customers online worldwide. We host a variety of gatherings locally for pagan families and welcome all to join where we bring a dish to share and drums with acoustic instruments to jam in celebration of life. We see clients daily in our private oasis by appointment and we serve the Dade and Broward community. We are a proud family witch shop and my purpose is to educate by sharing how I see life and the things that help me balance and empower daily. I feel that we all are here to learn from one another and our intent is powerful. Live authentically know yourself and what you want then visualize and ask if done right trust me you will receive. We have always welcomed all sorts of people with many situations without judgement and with open arms and I believe the world needs this compassion and human interaction without purpose of gaining just giving unconditionally when possible. When I listen, I am actively praying and sending a burst of action in your direction what you do with it is up to you. I teach this by becoming an example to myself and my children as well as those I come in contact with daily. I am always expressing what I see and feel really taking the time to hold space for those while we are in service so you can align release and recharge your energies. Everything we teach or create is made with intentional energies of cleansing, protection and new beginnings creating the shift needed when all else seems impossible we help you make it happen. Our daughter was diagnosed with Autism and the oldest with Impulsivity issues in 2012 right after my mom passed. The behavior escalated and we had to pull one out form school and homeschool for a year while trying to run our business and dealing with various meltdowns some in store weekly. We closed to modify as needed for our family and not having a physical store drastically decreased our revenue but our intuition guided us towards the decision. A few months after closing on January 2016 I was in the ER entering septic shock and was taken for a procedure to save my kidney from severe hydronyphrosis. In April the stent came out and they discovered a huge fibroid was now causing more issues and wanted to get it removed this had already had me with hormonal imbalances for over 2 years and severe pain another reason we modified. In July they tell me I’m pregnant but since the mass is with the baby we can’t touch it but it will most likely grow and possibly push him out to early or me rupture and bleed out. This was a shock and at that moment I stopped seeing my clients and was put on bed rest and my husband took over doing everything. Our business started to slow because I couldn’t do anything and our income completely stall but our choices were slim since my mom the only whoever cared for the girls was gone. We spent months in and out of the hospital needed blood transfusion and scared for my and baby’s life throughout. We shared it with our clients and community all our fears and obstacles. Amazingly so many people we have helped and met throughout the years from around the world started donating and we took care of the essentials for the last part of 2016 which had me in the hospital stuck to the bed with my water ruptured at 26 weeks until baby was born at 32 weeks. We spent 36 days apart and then I had a 3-lb. baby that spent another 5 weeks alone in the hospital, so many people helped and called also visited and lifted my spirits, it was hard on us as a couple and as a family and believe it or not now is when it’s getting back to normal as I slowly take on my sessions again and work on custom rituals daily. We overcome it because of the love for each other and our babies. Everything in life is a test and a lesson it’s all in what you do with it. Now we just need a nice family vacation to regroup. Mommy and baby are alive, he is great and we are grateful to be together again doing what we love next step for me is the surgery to remove the growth that continues with the hormones but all is well. Please tell us about The Witch’s Garden. We are a family witch shop. We teach about tolerance, spirituality, self-awareness, energy and magic. We guide people through spiritual consultations, workshops, reiki and we also offer house and business cleansings, chakra alignments and healings by appointments. I create an array of herbal floor sweeps, potions, candles and custom ritual kits and jewelry. Armando makes altars, staffs, leather pouches, talismans and more. We host workshops and picnics with drum circles locally every season and we encourage families to come out and celebrate life united. We invite groups from all religions to join in our spiritual discussions at our events and we encourage all to respect and learn from each other and see all the different viewpoints that create our community. We pride ourselves in always creating an environment of love and support whether at our shop or at an event and always bringing people together with the energetic shift and wisdom they seek and need. Keep it mobile and have a hidden treehouse shop.